Sweat beaded on Claire’s back, collecting along the ridge of her spine to run down into the waistband of her skirt. She shifted on the piano bench, her bottom numb, fingers dancing across the keys. She cast a quick glance up and around the tiny orchestral pit. It was a small space, crammed with four singers, one flutist, one violinist, one harpist, and one percussionist (surrounded by different drums, cymbals, and even a triangle), plus Claire herself and her piano. They were all barely visible in the grey, indirect light of the movie screen and the low, tiny lights clipped to their music stands. Orwell looked like he was about to faint from the heat (again), and Wallis was sneaking a sip from her flask while Lambert bellowed his solo at the top of his lungs; his voice echoed and rebounded from the back of the theater. Claire skipped her feet across the pedals, and the music accelerated. Dina plucked at her harp, faster and faster, the bun of her hair beginning to unravel, while her daughter DeeDee scrapped a fraying bow across the strings of her violin. Almost there. Her favorite part. Behind her, the audience leaned forward in their seats. Colored light filled the theater, the greyish-white giving way to hand-painted cells of brilliant blues, greens, and reds. A collective gasp, followed by oohs and ahhs. Applause and hoorays! Claire lifted her head, smiling, fingers never missing a key as she watched the climactic scene unfold on the screen above her. 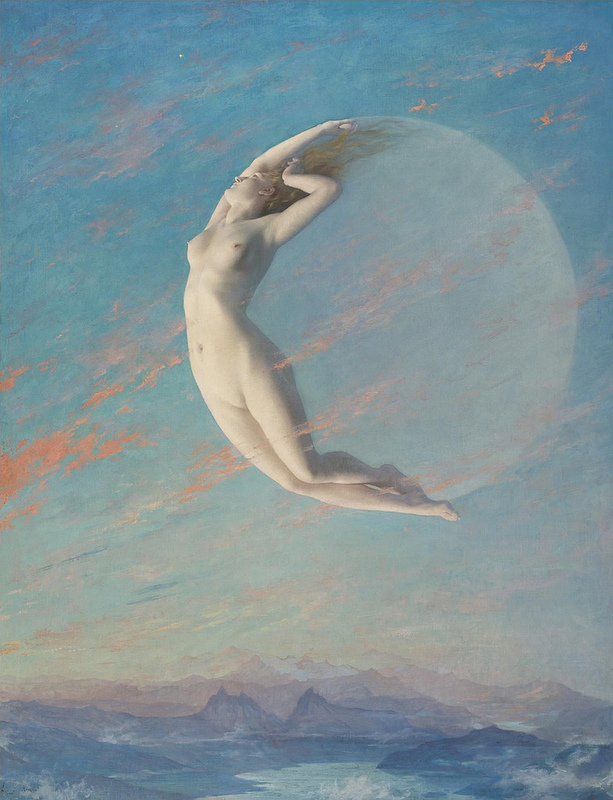 Selene, the hypnotically beautiful Mistress of the Moon, long silver hair streaming behind her as her ox-drawn chariot descended from on high. Her gown was the blue of the sea, and bands of gold graced her throat and arms and wrists. Professor Hecatodorus, tall hat clutched in one hand, pressed his back to the rocket which had carried him to the Goddess’ domain. Lunar nymphs swirled around him, arms waving, breasts gleaming. His mouth hung open in astonishment as the chariot dropped onto the lunar surface, the silver hooves of the oxen kicking up clouds of dust. They tossed their heads, snorting when the Goddess pulled back on the reins, halting the chariot in front of the gaping Professor. The nymphs circled around them, bowing low. Selene smiled down at him benevolently, lips a brilliant red, and spoke. On the screen high above, the Professor bowed low, sweeping his hat across his body. The Goddess held out her hand, bracelets shimmering, and he stepped into the chariot behind her. With a flick of her wrists, the oxen took off, running faster and faster until they leaped into the heavens, trailing silver dust, growing smaller and smaller while the stars flashed and danced with joy. The music reached its crescendo, Gregory banging away on the drums while DeeDee sawed at her violin. Claire’s fingers skipped and jumped across the keys and then, finally, an echoing silence as The End materialized on the screen. And then applause, the audience rising collectively to its feet. There were cheers and whistles and a few people pounded their feet. The house lights came on, gradually brightening. Claire grinned at the rest of the orchestra, pushing sweaty hair off her forehead. Dina gave her a tired thumbs up. Heaving a sigh of relief, Claire rose and turned to face the audience. As one, the orchestra bowed or curtsied. The applause grew louder, the whistles and cheers more insistent. Glancing over her shoulder, Claire smiled at the sight of Herr Maihack limping onto the stage from the left, the silver head of his cane winking. The tails of his formal coat waved languidly as he doffed his hat and bowed to the audience. He smiled, as he always did; and, as before, Claire was struck by the underlying note of sadness in that smile. She could not help but wonder at it. Herr Maihack’s film was a phenomenal success, winning over audiences and critics alike across Europe and Canada and the United States, and even Japan. President Roosevelt himself had attended the film’s premiere in Washington D.C. Rumor had it that the President had invited Herr Maihack to make a film about Roosevelt’s own famous charge up San Juan Hill — and that the German director had politely, but firmly, declined. The house lights reached their full brightness, and the applause faded. Murmurs and mutterings filled the theater as attendees reached for hats and coats and gloves, and ushers appeared to guide people through the doors and into the lobby and out onto the cold, Chicago streets. Claire looked up to see that Herr Maihack had already disappeared behind the curtains, stage left. Wiping her hands on her skirt, she began to clean up; she stowed her music sheets inside the piano bench, wiped down the keys and the bench itself, and then rooted around until she found her purse and coat. Claire flicked a look at Wallis, who was staring disconsolately at her empty flask. Dina followed the look. “Just coffee for that one,” she assured Claire. Dina grinned, wrapped an arm around her daughter, and slipped out of the orchestra pit, around the corner of the stage, and out the back door. Orwell and Wallis and Gregory and the rest followed, murmuring good-nights and good-evenings and see-you-laters. Claire nodded to them all, buttoning up her jacket; she had forgotten her hat again. The ushers were coming through now, sweeping up the aisles and picking up bits of trash and forgotten pieces of clothing. Nodding, Claire made her way up the aisle and through the lobby. Bright posters announced the films currently playing, and those coming later in the season. The ad for Palast von das Mond (The Palace of the Moon) Introducing the Glorious Gabriele Espinosa! and Co-Starring Frederick Vanderhoff! dominated the lobby. Selene, with her bright blue gown and bright red lips, stood regally in the center, an adoring Professor Hecatodorus and scantily-clad lunar nymphs clustered at her feet. Claire paused, eyes roving over the poster and the beautiful form of the Goddess. Something tugged low in her belly. Longing. A touch of melancholy, and just a bit of anger. Playing piano at the theater did not pay much — even less then her meager teacher’s salary — but she needed it. She needed to be here, in the dark, surrounded by the music, the Goddess lovely and bright overhead. For those few moments, when Professor Hecatodorus flew on his rocket through the stars and found sanctuary on the moon … well, Claire found sanctuary, too. Escape. Freedom from the unwanted attentions of Principal Kline, from the greedy hands and eyes of her landlord, from the cold of her empty bed and her nearly empty pantry. She sighed, tightening the belt of her coat. Hunching her shoulders, she pushed through the front doors. The marquee overhead flickered and went dark. The sidewalk had emptied rapidly, attendees disappearing in cabs or stumbling down the slippery street to bars and restaurants. Here and there, couples huddled close together, a few trailed by matronly chaperones or protective older brothers. The wind kicked up, swirling snow across the ground and flinging it in her face. Squinting, she looked up to peer through the skyscrapers. Heavy and swollen, the moon hung in the heavens, a few stars here and there visible against the glare of the city’s lights. — and ran right into Herr Maihack. His cane jabbed her hip. He smiled gently, lifting a gloved hand to tip his hat. “No need to apologize, fraulein. You were admiring her, ja? Like me?” He gestured towards the sky. Claire swallowed hard, the cold forgotten. Claire opened her mouth, but no words emerged. Her tongue got cold. She closed her mouth with a snap, teeth clacking. Tipping his hat in farewell, he set off down the street, coat tails flapping in the wind. Huddling inside her thin coat, Claire dithered, torn. Sympathy warred with confusion and — deep in her heart — just the tiniest bit of hope. But no. That was mad. There was no palace on the moon, there were no lunar nymphs, no exalted Goddess with a chariot drawn by snow-hided oxen. That was make-believe, stories told by the ignorant peoples of old, and for the amusement of people today. It was the twentieth century, after all. Squashing that tiny spark deep in her heart, Claire set off for MacNally’s. She had a few cents in her pocket; enough for a sandwich and warm cup of coffee with a dash of whiskey. The streetlights flickered overhead and the wind roared suddenly, tearing at her coat and skirt, then died away just as quickly. Weird sounds echoed down the street, bouncing off the corners of the buildings. Blinking against the snow that had been blown into her eyes, Claire stilled, ears perked. There it was again. Strange scraps, a clattering. Laughter, sweet with delight. And then a crack like leather and a clatter of hooves. Claire took a tentative step forward, craning her neck towards the corner of the block. Another hesitant step, biting her lip. And then she was running, slipping and sliding on the ice, grabbing the streetlight as she lost her footing and spun around the corner. She righted herself, knee twisting painfully, and stumbled forward. Off the sidewalk, into the street. The snow was thin here, but fresh, and the tracks were clear. They began in the middle of the road, and then disappeared into nothingness. Oxen hooves and the wheels of a chariot. An abandoned cane with a silver head lay near the left-hand track. Snow crunching beneath her shoes, Claire made her slow way over to it. Fingers numb, she bent to pick it up; it was heavy. Just as slowly, she straightened, gaze sliding from the cane, to the tracks, and up to the wide moon and sharp stars. There are doors, he had said, and she laughed.